The emerald cut is an elegant diamond shape and is sometimes referred to as a square emerald cut. While initially created for emeralds, it became a popular diamond cut back in the 14th century. Its long facets and large table are a window into its mesmerizing beauty. That’s likely why its popularity hasn’t decreased in over 700 years. 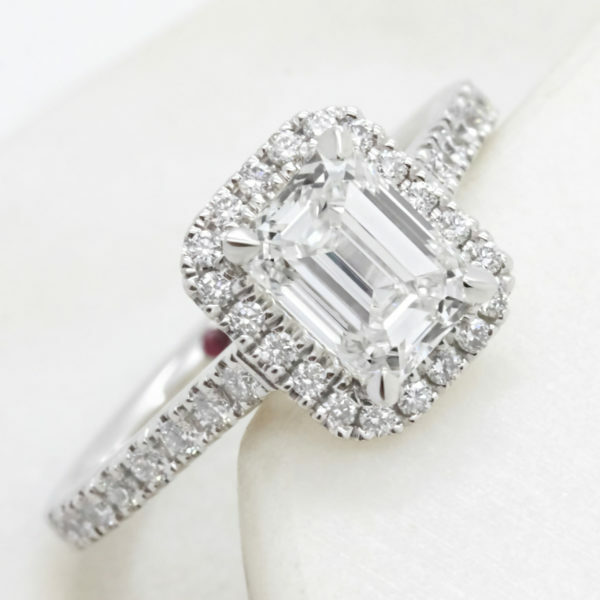 Why choose an emerald cut diamond? What is an emerald shape diamond? 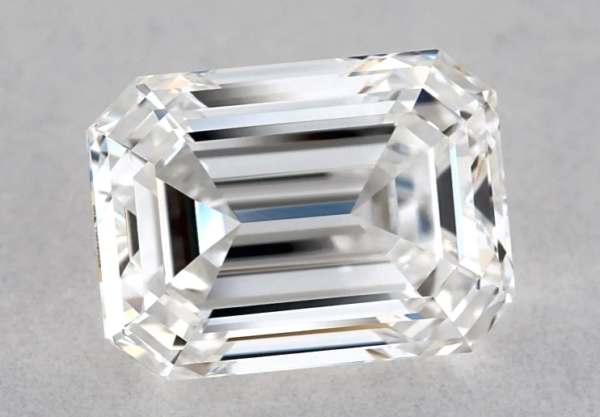 An emerald cut diamond typically consists of 57 facets and boasts an elongated rectangular shape with cut-off corners–its appearance is commanding. Instead of the brilliance and sparkle you’re used to with round or cushion diamonds, you’ll see flashes of light in the emerald cut due to its linear, straight facets. This effect is known as the “Hall of Mirrors”. Why should I choose an emerald cut diamond? The emerald diamond shape is striking–the flashes of light stand out against traditional brilliant cuts like a round or cushion shape. This unique and commanding aesthetic is seen on the wedding fingers of celebrities around the globe–from Beyonce and Jennifer Lopez to Camilla, Duchess of Cornwall, this diamond shape caters to all styles. The elongated shape of an emerald cut diamond is also incredibly flattering–it elongates the finger. Emerald diamonds offer a huge range of versatility in terms of engagement ring design. You could consider the soft curves of an organic-inspired design to balance its clean, geometric lines. Alternatively, stick to its linear structure and choose an Art Deco inspired design to maintain the structural look of an emerald cut. Traditional or entirely bespoke, an emerald cut diamond is a truly unique choice. Most emerald cut diamonds have length to width ratios ranging from 1.30 to 1.50. A ratio of 1.40 is considered “ideal”. However, ratios are dependent on personal preference. A lower ratio should be chosen for a more square shape, while for an elongated, more rectangular shape, a higher ratio is best. The chart below serves as a general guideline for choosing the ratio of an emerald cut diamond–dependent on whether you want a more square or rectangular shape. 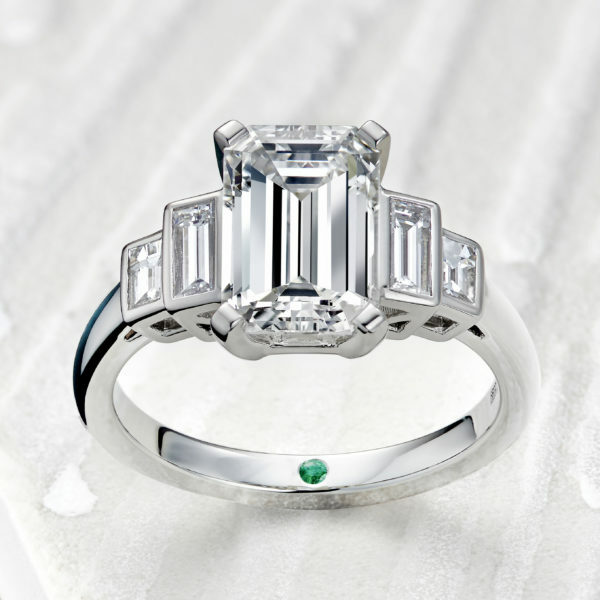 Emerald cuts have long, lean facets which produce mesmerising flashes of light. A clarity grade of VS2 (very-slightly included) and higher will ensure a completely eye clean appearance. While emerald cut diamonds don’t have an official cut grade, the chart below serves as a general guideline for evaluating the cut of an emerald cut diamond. 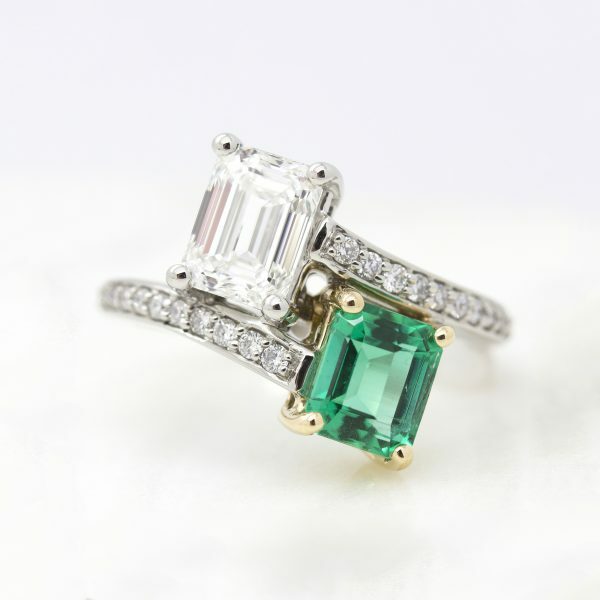 What colour should I consider when choosing an emerald diamond? Customers may prefer the warmer tones of colour grades G-H to the icy cool tones of colour grades D-F, especially when set in rose or yellow gold. Evaluating colour in emerald cut diamonds is entirely dependent on the preference of its buyer or wearer. However, due to the large, open facet structure of an emerald cut, any colour present in the diamond will be more visible. The colour chart below serves as a general guideline when it comes to choosing a colour grade for emerald cut diamonds. What clarity should I consider when choosing an emerald diamond? Due to the large, open facets of emerald cut diamonds, there’s no place for inclusions to hide. Because of this, we recommend considering clarity first when choosing an emerald cut diamond, before balancing up colour and carat weight.